Izzy is so mind-blowingly adorable sometimes that I almost can’t handle it. 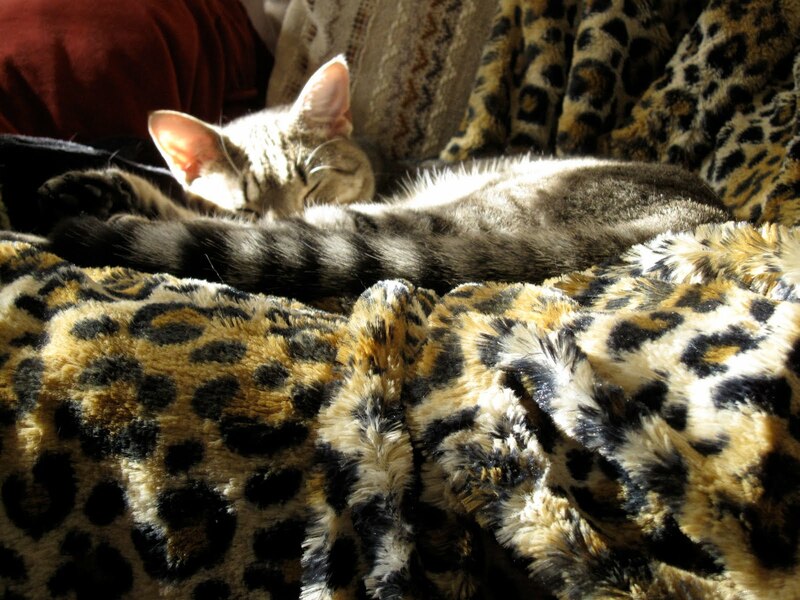 Here she is luxuriating on the blanket my mom bought her for Christmas. I live with “Cookie Monster” Wheeler, so I’ve made my fair share of cookies. Wheeler’s favorite is an oatmeal cookie with dried cherries, pecans and bittersweet chocolate from Cook’s Illustrated. But every once in awhile I like to try something new. So last night (I’m ashamed to admit that I was the one in the throws of cookie withdrawal, not Wheeler), I decided to whip up a batch of Heidi Swanson’s Sparkling Ginger Chip Cookies. 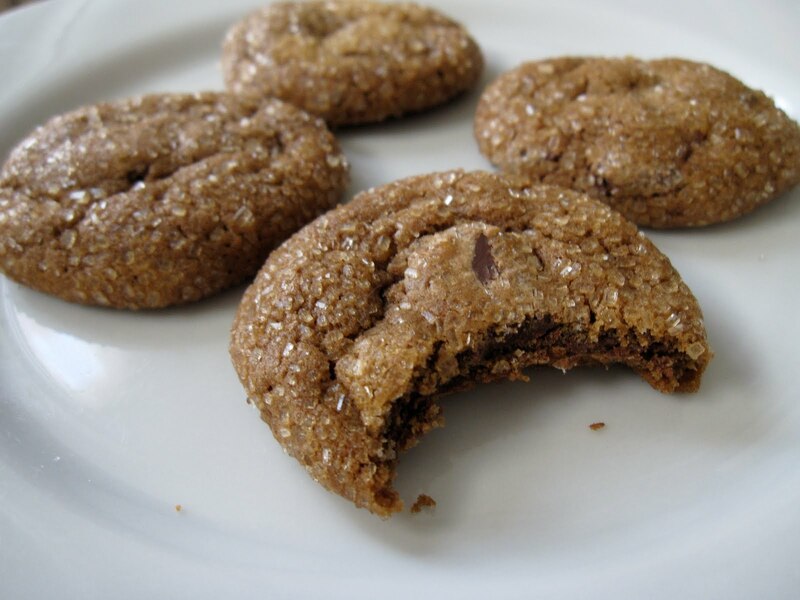 Ginger + dark chocolate + cookie = delicious. As I started to gather the ingredients, I had high hopes. But then dread set in. The recipe felt off. (Melted butter!? I have made gazillions of batches of cookies and NEVER — and I mean EVER — have I melted the butter first.) So as I stirred, I fretted. “These will never turn out,” I whined. “The batter is too soft. Now I’ve wasted all this expensive Ghirardelli chocolate!” Ask C.M. Wheeler and he will tell you that I never cook without fretting. He has long since ceased to believe me when I say something won’t turn out. I’m the boy who cried ‘wolf’ (or the girl who cried ‘cookie disaster’) too many times. Miraculously, the cookies turned out perfectly. In fact, they turned out so well, they may replace my go-to ginger spice cookie recipe off of Epicurious. Or perhaps I’ll combine the two into one drop-dead delicious cookie. WARNING: These cookies are intensely gingery, and they may not be to everyone’s liking. If you want a milder ginger flavor, I would drop the fresh ginger and add half the dried. If you can’t locate whole wheat pastry flour, you can substitute spelt flour. Or feel free to use all-purpose flour if that is what you have on hand. As far as the unsulphured molasses goes, I use Wholesome Sweeteners or Plantation Organic Blackstrap Molasses. I used a Scharffen Berger Bittersweet 70% here. You can use light brown sugar, or light muscavado sugar in place of the natural cane sugar. Preheat the oven to 350F / 180C degrees – racks in the top and bottom third of the oven. Line a couple baking sheets with unbleached parchment paper or a Silpat mat, and place the large-grain sugar in a small bowl. Set aside. Finely chop the chocolate bar (I used chocolate chips) into 1/8-inch pieces, more like (mostly) shavings really. In a large bowl whisk together the flour, baking soda, ground ginger, and salt. Heat the butter in a saucepan until it is just barely melted. Remove from heat and stir in the molasses, sugar, and fresh ginger. The mixture should be warm, but not hot at this point, if it is hot to the touch let it cool a bit. Whisk in the egg. Now pour this over the flour mixture, and stir until just combined. Fold in the chocolate. I like these cookies tiny, barely bite-sized, so I scoop out the dough in exact, level tablespoons. I then tear those pieces of dough in two before rolling each 1/2 tablespoon of dough into a ball shape. (I highly recommend making them bite-size. They are adorable this way). From there, grab a small handful of the big sugar you set aside earlier and roll each ball between your palms to heavily coat the outside of each dough ball. Place dough a few inches apart on prepared baking sheets. Bake for 7-10 minutes or until cookies puff up, darken a bit, and get quite fragrant. (Mine took about 8-9 minutes).